Immediately following a much-too-few blazing runs on Dynastar's Speed Course Ti ski, the entirety of my written notes consisted of two words: "I'm Sold." The Course Ti, part of Dynastar's Speed series, is a formidable reminder that while Rocker may be the next big thing for powder skis, camber reigns supreme when it comes to hard-snow carving. I would describe the quickness of the Course Ti as somewhat akin to clicking your brain directly into the ski's bindings—you think it, the ski does it. That's not to say the Course Ti is for everyone. The Course Ti is an expert and elite-level ski, one notch below Dynastar's World Cup race stock, designed primarily to satisfy the hard snow, need-for-speed crowd (ie, former racers). A ride this active can easily going to overwhelm lesser skiers. 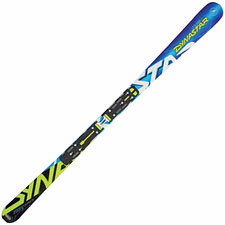 That said, Dynastar has taken care to ensure that the Speed-series skis are user-friendly for civilian-level racers, tweaking those merciless world cup skis just enough to keep the best qualities of the racing stock while infusing the entire line with fun. The result on hard snow or groomed packed powder is simply magic. Lay it over on its edge for big, screaming GS turns; stand upright and bang out slalom turns as quickly as you can. Edge grip is excellent. Initiation is lightning-fast. The Course Ti seems to anticipate your heart's desire and makes it come true. I should note that a ride this active demands a lot of energy—I probably doubled my normal turn output per run, so expect to get a workout when you ride it. Do advanced intermediates dare step on a hot-blooded plank like this? Dynastar says yes. If you are looking to improve your technical turning skills, or discover the joys of high-level groomer skiing, the Course Ti will certainly not offer any limits to what you can accomplish. I will say, however, that it is likely too much of a leap for those who aren't already making pressured-edge, fall-line turns. As a former racer myself, I have to say, I find the Course Ti liberating in an important way. Literally 30 seconds after I pushed off on them, I realized that for me, the notion of the one-ski quiver was dead. Never again will I be satisfied riding an All-Mountain generalist plank on smooth snow. The sheer joy that the Course Ti brings to groomer skiing rivals (if not exceeds) the thrill of bottomless powder.